I read this book March 2012, I really liked it. The original book was written in French language. In case you prefer to read it in its original version, I found out late. As it is written on the book, this is an African Literature classic (just like Things Fall Apart), I think if you love African Literature you should start form both of the books I just mentioned. This is a book that would and could be read even 100 years after its first publishing. I have to confess that I found it difficult to be hooked with this book in the beginning, but at last I did. It is just a 100 pages novel but it was thick to go through but it really worth all the effort. 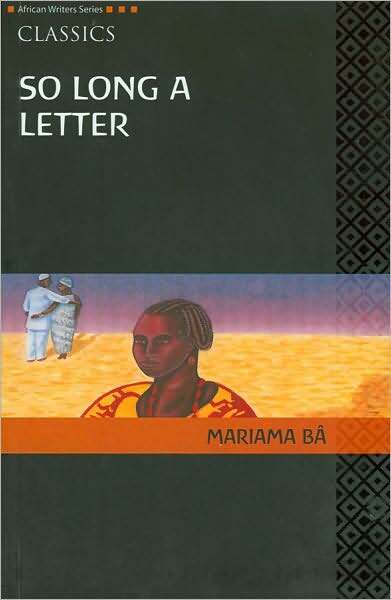 This is one of African Classics, as I earlier said, story took place during post-colonialism in Senegal. It is your starting point to African Literature. I admire everything about this book.